It must be October! I have my first cold of the season. It’s actually more than just a cold…it feels like someone twisted my neck and upper back and then threw something at my head before sticking it down my throat. But enough about me. Let’s move on to the delicious stuff. I made this dish back in August, when tomatoes were still in their heyday…but since they’re baked, you could make this anytime and still yield a good result. We really loved this and plan on making it again soon. Preheat oven to 450 degrees. Line a baking sheet with foil and spray with nonstick spray. Place salmon on sheet and sprinkle with salt, pepper and garlic. 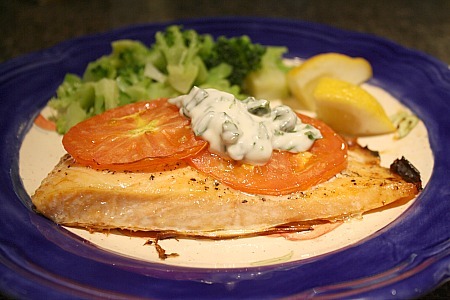 Place tomatoes on top of salmon and drizzle with oil. Bake for about 10 minutes. Combine mayonnaise, basil, lemon juice and a pinch of salt in a small bowl. Mix well and refrigerate until ready to use. Remove salmon from oven. Tent foil on top of fish and leave covered for 10 minutes. Remove fish carefully from pan and plate. Dollop mayonnaise on top of tomatoes and serve. 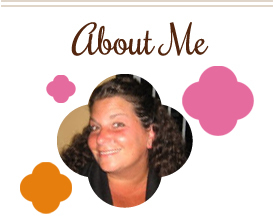 This entry was posted in lemon, main dishes, QuickAndEasy, salmon, seafood, tomatoes. Bookmark the permalink.